My wife and I love Indian curry, and are always on the hunt for new places to indulge on the island. Last week she surprised me by making a reservation for our anniversary at a new Indian restaurant we’d been meaning to try for a while. Tucked away on an unassuming street, it might not be exactly what you picture for a romantic dinner, but for two curry-lovers, it was just perfect! As soon as we walked in, we were immediately greeted by the hostess, waiters and chefs. I even think the tandoori oven said hello. At that point we knew our experience would, at the very least, be pleasant. Once seated and given menus (complete with pictures and descriptions for those not quite sure the difference between vindaloo and balti), we knew we wouldn’t be leaving hungry either. Although we aren’t exactly novice Indian food eaters, we still always ask for suggestions on what to order and in this case were very glad we did. Upon recommendation, we started with Malai Tikka, a kebab baked with milk, to create the most melt-in-your-mouth chicken you can imagine. The flavors were perfectly balanced. We also ordered Tandoori chicken, which was both juicy and tender, a surprise to me, as I find Tandoori chicken almost universally dry. The presentation made my wife happy, as they’d put all the cucumbers together in little hearts. The chef also surprised us with a bean pakora. These fried little morsels had just enough heat for me and maybe a bit too much for the wife. After appetizers it was on to the true test, the curry! I am very predictable when it comes to ordering curry: if there is some sort of seafood curry on the menu, that is what I’m getting. This time was no different, I chose the fish curry, and to ensure my status as a glutton, I ordered a full side of saffron rice as well as garlic naan. My wife went with the staff’s recommendation and ordered the saag paneer set, a spinach curry with milk and fried paneer cheese. The set came with all of the usual suspects (curry, rice, naan, a salad, and a dessert). Although my fish curry was was the best seafood curry I’ve had on island, I will be ordering the saag paneer next time, and possibly every time! It was just that good. You could put this stuff on cardboard and I would take a crack at it. Creamy, rich, and both sweet and savory at the same time- this dish had it all. Luckily for us, no cardboard was in sight so instead we got to gorge on some of the best naan I have ever had. The naan hit the grand slam mix of crispy, chewy, soft, and warm. I ordered the garlic naan, while she got cheese naan with her set, so we split both and I cannot imagine doing it any differently. We raved to the waitress so much about the cheese naan, that the chef gave us an up close demo of how he makes it in the tandoori oven. A true skill that I am glad talented men like him have, as I am certain I never will. We read a sign on the wall that said lunch sets come with all you can eat naan. I’m planning to see just how much I can eat one of these days! Completely stuffed and thoroughly dosed with authentic Indian beer (which was just one of the little details that added up to make Indira the best curry joint we have found), we were just about ready to ask for our check, when they lowered the lights and the music changed to a low romantic ballad. All of a sudden the whole restaurant was looking at us, as they brought out a beautiful cake that read “The Marriage First Anniversary.” It was such an unexpected and unforgettable gesture. The kind of thing that would never happen back in the States. Because the cake was so large (and we were so full) we asked our waitress to please cut it for the whole restaurant and staff. It was delicious, so we asked for the name of the bakery, (and I’ll go ahead and share it with you here, in case you are ever looking for a delicious chocolate cake covered in berries: Petit Four 098-973-5784). Indira would have likely become our go-to Indian restaurant on island based solely on the curry, but when food that good is coupled with service that makes you feel like family, it’s hard to imagine it could ever be replaced as one of our favorites. Hours: 11:00 a.m. – 3:00 p.m. and 5:00 p.m. – 10:00 p.m. Closed on Wednesdays. Directions: Out of Kadena Gate 2 head straight down 20 to the intersection of 330 (four corners) and turn left. Proceed down 330 (which turns into 75) for approximately 10km and turn right at 16. Go through the first traffic light on 16 and you will see Indira 200m past the light on the left. If you go through the 5 way intersection you have gone too far. Parking is available if you take the greater than 90 degree left just past Indira and go behind the building Indira is located in. Amazing Indian food. Been here almost 3 years and found this place about 3 months before we pcs. The lunch menu is very affordable, food is awesome, staff is extremely friendly. We love Indira. They are very friendly and the food is consistently delicious. The directions are horrible. Take the 330/75, right past the 85, turn right on the 16. It’s down on the left. Tonight, we returned to Indira for dinner with a couple of friends who truly enjoy good Indian food. We were saddened to discover (as mentioned above) that VK is no longer a part of the business. That said, the chef was the same as before, and the food was delicious. This was our first time eating dinner at Indira, and their set menu options are really excellent. The naan bread continues to be the best that I’ve had between Germany, the UK, the US, and Japan! Great to see that, despite the ownership change, they continue to make top quality food. I truly love this place. My mother and father in law found Indira when they came to visit us. They rented a car for the duration of their stay with us and went there to have lunch while my husband and I were working. While there, they got to know the owner and heard his story. Because of the amazing food and wonderful owner, we went back with them a couple days later. My husband and I loved it. The bacon naan is absolutely delicious and the three different curry dishes I had were just as good. Please, please give this place a try! It has a small, intimate atmosphere and the food is great! Unfortunately the ownership has changed and VK is no longer part of Indira. VK is so personable and always went out of his way to make our dining experience extra special. He would often prepare dishes not on the menu, or bring us his wonderful creations to sample. I can’t imagine Indira without him! Alright, iv been on island about a year and tried most of the Indian food around, and this place absolutely slaughters the competition. Head and heels above the rest. My girlfriend and I each had butter chicken and I tried the chicken tikka; both of which were amazing and on point, thoroughly spiced to perfection. They curry was stellar also, if you appreciate great Indian food this place is a definite can’t miss on your list. I will be coming back many times!!!!!!!!!! Not to mention as said before very welcoming great staff. By far the best Curry on Okinawa. My wife had the butter chicken and I tried the Mutton rogan josh. Unbelievably delicious. The service was fantastic. VK (the owner) is very attentive without making you feel like he is hovering. We will never go to another Indian/Curry restaurant again. Thanks VK! We’ll be back soon!! My husband and I just had dinner at this great, little restaurant. WOW!!! Everything we ordered was just phenomenal. 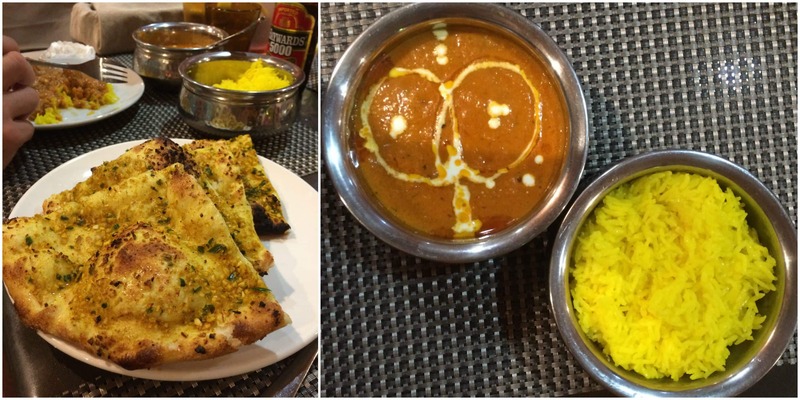 We tried three different types of curries, and three different types of naan. Everything was absolutely delicious. The service was great, the owner was professional and very attentive. We had a great dinner AND a great lesson on different dishes within India (north and south). I will definitely be back…and I will bring my friends. As a general fan of Indira, I was concerned after reading some negative press and after having a few friends pass along their “meh” experiences here. We visited today for a late set lunch and decided to order dinner to-go. The food is flavorful. The service is prompt and friendly. The price is reasonable. My husband and I tried Indira last night for a date night. It was delicious! The bacon naan, South Indian curries, spicy chicken, and the extras that VK brought us “just because” were all outstanding. Service was wonderful, and the Indian beers were a treat for my husband who loves to try new ales. VK offered to teach me how to prepare any dish that I was interested in learning (I’ll definitely be back for that lesson), and then when we were short yen because my husband miscounted before we left home he said we could just pay next time. We were able to scrape enough together to cover the rest of our dinner bill when we went to the car though. Everything was so wonderful I would have felt bad leaving VK and his staff short on the bill until we are able to return. And we will definitely be back. It’s a must do to try some less familiar Indian dishes as most other places serve the more well known North Indian dishes. So pretty late in the evening on valentines/white day my wife and I stopped by Indira for the first time. Most couples look for candlelit meal on V day, but our obsession for Indian (and Thai) dishes made trying a new curry place the perfect choice. The service and food was excellent. The owner of the place was hovering around as we ate and provided a extremely down to earth level of service that put us at ease immediately and made us want to come back to eat again even before we started our meal. Although northern and southern Indian food is available, choose southern Indian food on your first visit. If you don’t know what to select, ask for some advice and you will be pleased with the results. Lunch may offer less variety (I really don’t know), but our options for dinner were really good and left me wishing I had not eaten anything so I could go back and try new stuff. We had a really nice time and will certainly return & recommend to friends. Generally this is what called best food in Japan. ??? On a dayoff opened Restaurant only for jk family three of us waiting on this family ,very bad service is out of the question. I was born in south indian family all my life time have been eating south indian food and have been working in food industry for 40 years . seems JK has a few Restaurants in Hokkaido, I wonder what kind of food he is serving .Anyway i am not a competitor . We tried several dishes tonight at Indira and loved them all. I got a South Indian chickpea dish and asked for it spicy, and it came out perfect – lots of heat but not so much that it distracted from the wonderful flavor of the sauce. The chickpea naan was delicious and something we hadn’t seen or tried at any Indian restaurant before. The dosa masala and chicken kebabs – also great. We’ll be back very soon and look forward to another great meal and seeing the very nice owner again. He was a really good sport about entertaining our rambunctious toddler, who loved him. Oh, and for families with kids – this restaurant is kid-friendly. I saw at least two highchairs, both WITH STRAPS (essential for those of us with little Houdinis) and even some toys! If the parking lot in front is full, just hang a left immediately after the restaurant and there’s more parking in back underneath the building – you’ll see it as soon as you make the turn. We frequently take the 16 home from Kadena and discovered this place right after they opened. One night we took a chance and stopped hoping it was English friendly. Our family loves Indian food and were excited to find a place close to home. To our delight VK speaks wonderful English and was warm and welcoming. Our first meal there hooked us. As stated by everyone else their naan is the best you’ll find on island (and many other places). He made the butter chicken sweet for my youngest who doesn’t do spice. The masala dosa is my absolute favorite item on the menu and I always find myself craving it. Since our first visit we have regularly stopped in to eat. VK and his staff are always a pleasure to interact with and my husband is always getting a lesson in Indian spices and cooking. VK once told us he had a restaurant on mainland Japan for many years before relocating to Okinawa. I have also stopped in for lunch with coworkers and their lunch specials are a steal and the perfect amount of food. I rarely write reviews, but I can’t say enough good things about this establishment, the owner and the staff. I’m so happy so many others like it as much as we do. They definitely deserve any recognition and success that comes their way. Tried Indira for lunch today and was so thrilled with the delicious food. The naan was out of this world. I had the palak paneer and loved the silkiness of the paneer. My two teenagers had butter chicken and murg tikka masala (chicken) and both really enjoyed their meals. They also agreed the naan was amazing. It is on 16, heading south away from Kadena, just before the second stoplight after 75 on the left hand side. The letters are in big “roman” letters – Indira. Thanks for posting GPS coordinates, if it weren’t for it my husband and I would have gotten lost. You were right too, the owner and chefs were super friendly, they even allowed me to go inside the kitchen to see how they bake the na’an. Anyways, I ate there earlier and I loved their food (I ordered bacon na’an, kebab, samosa, lassi and this crisp crepe with chopped potatoes). I hope more people will give this place a try. V.K if you get to read this, please include the coordinates Robin gave when you write your address. That way, people can easily type that to their google maps or whatever and drive to your place. I went to Indira with my family a few nights ago. The food was good, but pricey and not very filling. The staff, however, was very welcoming and attentive. We were planning to pay with a credit card, but his machine was down. He said we could pay another time, which was surprising how trusting he was. He did let us pay with American dollars though so it wasn’t a problem. He also was very good with our son and even brought him a gift to leave with, a bobble head dog. Overall, we had a pleasant dinner there, but we left hungry after spending $41. There spicy chicken on the South Indian menu is a must-try though. It was delicious. Also, the directions given add about a half hour travel time. As someone previously stated, going out of gate 3 is definitely the way to go. It is about a 10-15 drive from there, depending on traffic. We’re summer arrivals to Oki after 4 years in England, where we learned to appreciate excellent Indian food. We’ve been suffering from withdrawal for some time until I noticed this review while sipping this morning’s coffee. Lunch at Indira was excellent – tried one of the set menu options. Excellent flavors, spiced to our individual liking, and fantastic service from VK is what we discovered. My wife and I agree that Indira serves the best naan bread we’ve ever eaten (and, Lord, have we tried a ton)! I highly recommend this place to those of you who are lovers of Indian cuisine, and you who are just curious. Saturday Lunch. VK remembered us (after a single visit!?) and our spice desires. The set menu was tasty, as always. We decided to ask about take-away, as we our need for Indian curry simply bloomed after lunch. The Butter Chicken was very flavorful and complex. The Mutton Rogan Josh, spiced around a Vindaloo on request, was excellent. The tamarind rice had a slightly sour flavor that complimented the curries nicely. Of course, we asked for a naan to help sop up the sauce. This was the best Indian take-away that we’ve ever eaten, including 4 years of many different Indian restaurants in the UK. Kudos to the Indira crew, and many thanks to VK for the discussions about spices, flavors, and the use of food in medicine. My daughter and I went there the other night. The owner was extremely friendly. As others said, the food quality was awesome. The owner made my dish a bit spicy (as I requested), but then (when I was half done with my dinner) he added a type of yogurt that brought the spice level down. My point, they went above and beyond to make sure the customer got what they want. I’m definitely going there again. Prices were reasonable too. Also, there is plenty of free parking below the restaurant in the garage basement for those that find the front stalls full. As for directions, the way I would describe it: leave from gate 3 at Kadena and take the most direct route to Ikie island, following the signs going East. You will see the restaurant on your left after a few miles. Wonderful food served by wonderful people. I have a critique for the driving directions, though. The directions given from gate 2 takes you through many, many stoplights and slower residential areas, and is about 11km. Here’s the reverse of how we returned to Kadena from the restaurant. Go out gate 3, turn right(east) on 74. Stay left on 74 through the 3-way intersection which is underneath the toll road. 74 turns into 16, which is the road the restaurant is on. Indira is about 7km away once you have turned left at the 3-way. We just enjoyed a wonderful lunch at Indira. Great lunch specials and yummy Masala Dosa. We will be back again.